When we strategize about change on a large scale, as with more tactical changes it’s important to pick the right moment. There is a flow to events driving outcomes. Sometimes we refer to this as timing, but it’s more about trends. We like the wind behind us, but more often than not crises dictate change because humans tend to procrastinate, be overly optimistic and resist change. Consequently, we plan poorly for crises. On the other hand, as Judith Rodin’s article, “Anniversaries Are Not to Be Wasted” (Harvard Business Review, November 2012 edition), indicates, various company anniversaries, including those of key employees, are different. We know when they are coming, and we like to celebrate them. The key is tapping their potential from a change perspective, not just a “feel good” or esprit de corps one. To do this means connecting the anniversary to the change. Anniversaries encourage us to ponder the past, present and future. The change we are promoting becomes the future while the past and present form the change’s context. Any change is more powerful with a context. Therefore, rather than show the change as something new, revolutionary and different – which create uncertainty and resistance – show it as a natural progression for the company or fitting within its mission. For example, early in the 1900’s military people resisted tanks until they came to view them as armored horses. 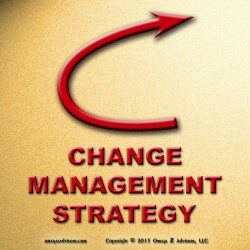 However, this means our message about change needs refinement similar to our marketing and advertising. Many large corporations have whole staffs devoted to internal communications responsible for this message. Thus, history in these areas suggests refining our message is worthwhile. For instance, anniversaries provide historical contexts, but many people love history about as much as they love change. That’s why they’re called anniversaries and not historical reviews. Message is important.